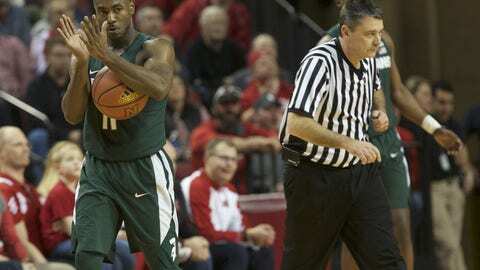 Michigan State basketball traveled to Lincoln on Thursday night and came away with an important victory against Nebraska. Michigan State went the entire month of December without a road victory and that all changed on Thursday night as the Spartans defeated Nebraska, 72-61, in Lincoln. The Cornhuskers had been a thorn in Michigan State’s side for the past few years and the Spartans came out hot and didn’t look back. Just like they needed to, the Spartans took a nice lead in the first half and extended it in the second. Hot 3-point shooting was key as well as beautiful ball movement which broke the Nebraska zone on multiple occasions. The Spartans are now 14-9 on the season and 6-4 in Big Ten play. They are starting to come together after a recent three-game losing streak. The big difference may have been the bench as the Spartans’ scored 31 off the pine and Nebraska had just nine. Miles Bridges was the top player for the Spartans and it was safe to say he was on fire early on and didn’t cool down. He finished with 16 points and six rebounds with a block on 7-of-10 takes. Nick Ward played through the flu and even in limited action, he looked like a monster in the post. He finished with 10 points, four rebounds and a block. Cassius Winston was a spark off the bench. He made some slick passes, clutch shots and looked like the starting point guard. He finished with 10 points and four assists. Michigan State will look to extend its win streak to three on Tuesday with a road contest against the Michigan Wolverines. State bragging rights are also on the line — the Spartans just beat the Wolverines on Sunday.